President Ibrahim Mohamed Solih has appointed Hassan Sobir as Ambassador Extraordinary and Plenipotentiary of the Republic of Maldives to the Kingdom of Belgium and Ambassador Extraordinary and Plenipotentiary, Head of Mission of the Republic of Maldives to the European Union and presented him with the letter of credence at a ceremony held at the President’s Office this afternoon. The newly appointed Ambassador Hassan Sobir attained Master of Business Administration (MBA) from University of South Australia, Diploma in Economic Statistics from USA and Bachelor of Commerce from India. 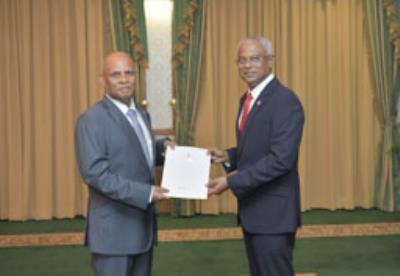 Previous work experience of Ambassador Hassan Sobir includes the post of Permanent Representative of Maldives to UN Office in Geneva, Non-Resident Ambassador of the Maldives to the European Union, High Commissioner of Maldives to the United Kingdom and High Commissioner to the Republic of Singapore.